Visual Studio Code>Other>IndenticatorNew to Visual Studio Code? Get it now. Visually highlights the current indent depth. This extension can be used by itself, but it's recommended to use it alongside the builtin indent guides. Peeking around the current indent block: Optionally a hover can be added on the current indent marker to peek before and/or after the current indent block. Language specific settings: The extension can be configured for each language separately to accommondate the requirements of different coding styles. Highlight Styling: All indent highlighting can be styled individually by defining color, width and border style. If you don't want the new active indent guide but still want to use the old indent guides you can assign the same color to both of them as a workaround. That way the active indent guide won't be distinguishable from the the normal builtin indent guides. indenticator.languageSpecific: The language identifiers can be viewed by using VS Codes language selection in the statusbar. 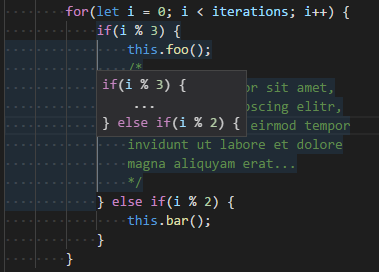 To be analogous to language specific editor options of VS Code the key has to be put between square brackets. But to simplify configuration of similar languages multiple keys can be listed within the square brackets as a comma seperated list. Any setting for indenticator that can be set normally, can also be set for the language specific configuration. If any setting is not set for the specific language the overall configuration will be used.